2 What is a Built-In Wine Cooler? The need for a good wine cooler is often highlighted by a growing wine collection which you’ve probably already spent a lot of money on. 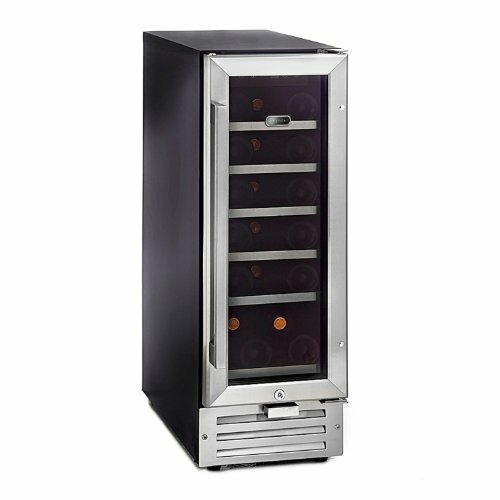 Hopefully your specific need for a wine cooler hasn’t been brought on by some of your prized wines in your collection getting spoilt as a result of improper storage. 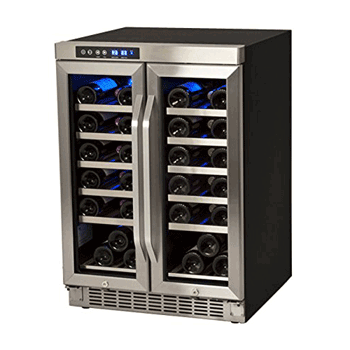 Our selection of the top-rated built-in wine cooler reviews is aimed at those wine enthusiasts who are a bit more serious about their growing collection. We hope that the information we’ve gathered will go a long way in helping you pick out the best built in wine cooler. 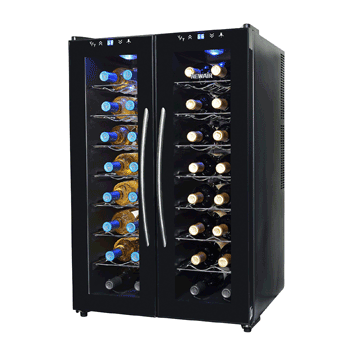 True to EdgeStar’s promise of designing wine coolers and other products that effortlessly fit into various lifestyles, this 52 bottle built-in cooler immediately stands out through its elegant design. This is fast becoming a popular under-counter cooler among serious wine collectors who have a large selection they want to store and display effectively. The wire shelves are trimmed with wood and slide-out very easily and the double-pane door has tinted glass to display the bottles beautifully while offering UV protection. The door is also reversible, which is convenient for placement purposes. A very intuitive and easy to use digital control unit allows you to monitor and set the internal temperature, which ranges from 40-65F. This wine cooler gets the basics of wine storage just right. It has controls that are easy to understand and operate. A very good looking wine cooler that always manages to get visitors and fellow wine lovers talking and it does the job of keeping your wines cool well. Built to last, this is a wine cooler fit for the storage, chilling and regular access to even your most prized bottles in your collection. The price is definitely justified. 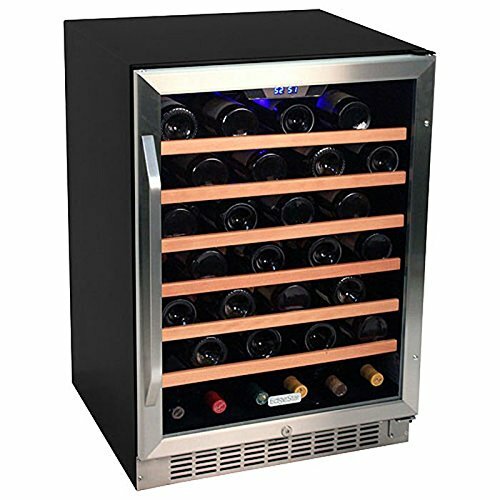 Check out our list of the best EdgeStar wine cooler reviews to get a detailed view of more options from this manufacturer. Check The Latest Price Now! This Whynter 18-bottle cooler can actually hold 19 bottles. The design is of a premium quality and demonstrates quite a bit of innovation. The door is trimmed with stainless steel and is finished off with an L-bar, stainless-steel heavy handle that gives it away as a purpose made built-in wine refrigerator. The compression-based cooling technology used allows for a wide temperature range of 40-65F, which can be monitored and controlled using the digital LED display/control unit. This cooler is particularly good if you don’t want to remove some bottles for decanting (so that they can “warm up” a bit to their ultimate serving temperature) in fear of raising the temperature too high for the other bottles you want to keep storing at optimal storage temperatures. We suppose it would have been unusual for a wine fridge manufacturer to state their cooler’s capacity at 19 bottles, but this cooler can, in fact, fit one more bottle than the official capacity of 18 standard bottles. 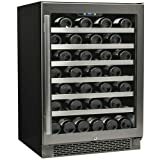 This is a great wine cooler that will do its job very well, but it’s perhaps one for short term use. This 54 bottle wine cooler from Avallon is definitely one for the serious wine collectors. A large capacity obviously means you’re planning on storing a large collection of wine bottles, but you get more than just large capacity with this cooler. Featuring a contemporary design with stainless steel trimming, this cooler will fit in well with most interiors. A LED light which lights up your bottles through the clear glass adds some class to the room it’s located in. A very powerful compression based cooling mechanism is enhanced some air circulation fans to chill your wines at 40-65F. This wine cooler looks relatively nice, but the large capacity of 54 bottles can make it look more like a commercial wine cooler. Not the quietest cooler around, but it gets the job done well. Cools the bottles evenly and it has shelves that are pleasantly easy to pull in and out. 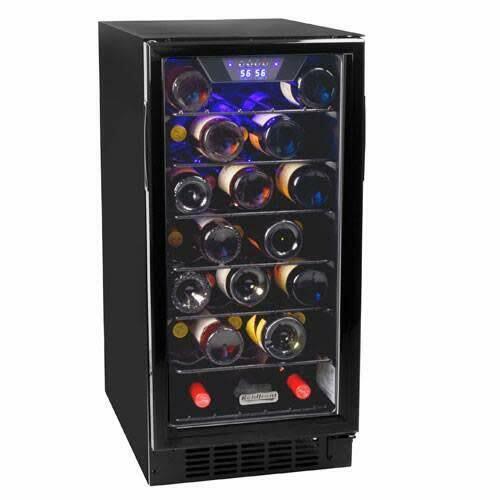 This is a good wine cooler that does the job well and is also built to last. A capacity of 30 wine bottles makes this a built-in wine which can also be used for commercial purposes, but it looks just as good in the kitchen, home bar, man-cave or anywhere else in fact. Ideal for replacing an old trash compactor, this Koldfront cooler has slide-out shelves which will store your bottles elegantly, while the cooling unit will give you 40-65 F of temperature range. A blue LED light will enhance the view of your wines while they’re being chilled to perfection. This Koldfront single zone cooler is one of the best-looking coolers to replace a defunct trash compactor. It is has a very reasonable price and is ideal for under-counter installation because of its front-facing ventilation unit. A large 30-bottle capacity is always good. Check out more Koldfront wine cooler reviews if you’re not necessarily specifically looking for a built-in wine cooler. 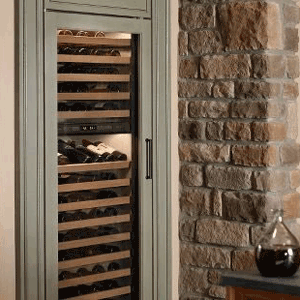 What is a Built-In Wine Cooler? attached to the surroundings it’s going to be housed in. To point you in the direction of a more practical example you may be able to relate to, a built-in wine cooler is one you’d likely buy to fill that 15” space left vacant by what used to be your trash compactor. So it’s more of a “permanent” wine cooling solution you’re not likely to move around. One which you’ll have built into a spot you identified as the perfect place to store and perhaps display some wines you might want to regularly access. Naturally, built-in wine coolers are often compared to freestanding and countertop coolers. In the case of built-in coolers, we’ll use two different types of homes people live in as an example. You have mobile homes, like RVs and you also have permanent, brick-and-mortar homes. As with the permanent brick-and-mortar home, a built in wine cooler would naturally have more features built into it because it’s not designed to be moved around very often. A built-in wine cooler gives you more power due to its typical use of a compression cooling unit, is more customizable to fit in with the overall style of your interiors, has additional features such as a good security lock, is extensible (can be used to store and refrigerate many other things apart from wine) and can be useful in storing foods that go well with wine, like cheese. Built-in/under-counter wine coolers are generally very durable and built to last very long. Depending on where you buy your wines and according to your personal tastes, preferences, and frequency with which you consume your favorite varieties, any wine collection can be considered to hold significant value. It’s, therefore, an investment you’d want to protect. For a serious wine enthusiast, one of the major ways through which you’d naturally seek to protect your wine collection is through buying a wine cooler. You’d naturally consider a built-in wine cooler as a little bit more of a “permanent” investment. While there are indeed a few different types of wine coolers, settling on a built-in wine cooler would suggest that you’re looking for a specific set of benefits usually found only in built-in coolers. Perhaps you’re aware that built-in coolers are generally designed and built to last for long periods of time, enjoying more durability than freestanding or countertop coolers. 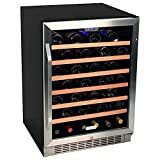 Manufacturers are also aware of the type of wine enthusiast who’d consider purchasing a built-in wine cooler and so they’ve largely catered to the specific needs thereof. 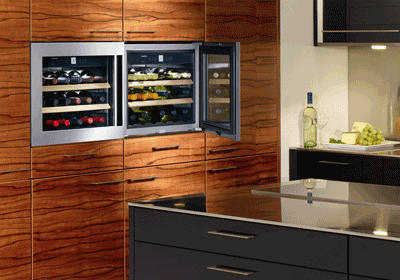 What you can expect to get out of a good built-in wine cooler is a very powerful cooling system. Its design typically makes use of compression cooling and places more emphasis on the cooling functionality it delivers as opposed to prioritizing features such as environmental friendliness or silent operation (as would be the case with a thermoelectric cooled wine cooler). A compressor with a higher BTU rating results in quicker cooling and much more accurate maintenance of the ideal temperatures you’d typically set for your stored wines. Built-in wine coolers are built for long term use in many ways, including inconspicuous but very crucial features such as integrated humidity control and the ease with which you can customize their outward appearance to blend in with the spaces you tend to keep them in. 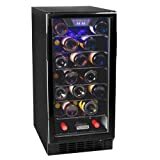 Our own wine enthusiasts put these best built in wine cooler reviews together in order to assist the more serious wine enthusiasts to discover the perfect one for them. In doing so we discovered that the one major consideration which will ultimately lead you to the best built-in wine cooler for you is indeed the question of exactly what you’re going to do with it. Pretty much all featured built in coolers were built to deliver great performance for a considerable amount of time to come, so it comes down to where you’re going to mount your cooler and things like how often you’re going to drink your wine.